After I saw the first couple of bicycle art objects when they were placed around Lincoln, I found myself bicycling to every piece I could find, so that I could see it and add it to my photographic collection. Some might say it was an obsession. I imagine the organizers of the project had in mind something like aesthetic enrichment for the community, but they might not have considered cardio-vascular conditioning as one of its benefits. It has been both for me! The bikes are even cuter/more interesting/more beautiful up close, so I tried to photograph some of the parts you won't see as you're driving by. There are a whole bunch of photos below. Don't infer anything by the number of pictures of any particular bike. Circumstance as much as anything dictated how many pictures were taken. And, a lack of my comments doesn't mean I don't like the bike; perhaps it speaks for itself. The artists have made comments of their own, by the way. You can read them at ArtScene.org. You can see my daughter in a few of the photos. Although my other family members weren't afflicted (blessed?) by the obsession that I had, they also have enjoyed them quite a bit. You can also see my faithful companion, Schwinn, in some of the photos. I'm a bit sad that the bikes are being removed now. The summer seemed too short. The bikes will be gathered together for a public auction, which is to be held October 3. I'm hoping many of them will be put back on display by their buyers. 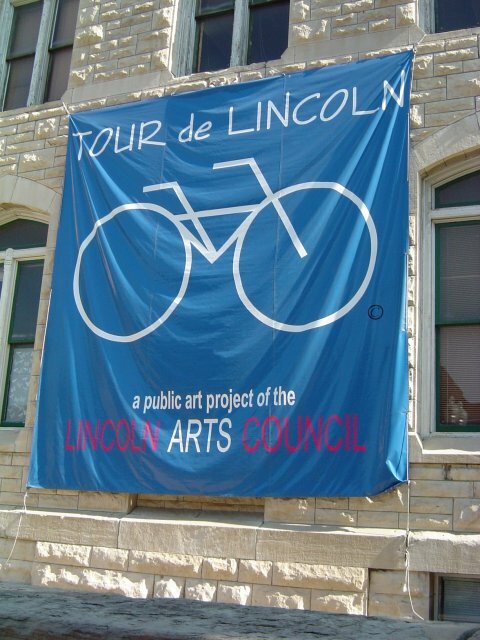 My thanks to the artists, to ArtScene.org and the project organizers, and to the sponsors for adding a little joy to my summer, and for helping to make Lincoln the special city that it is! Oh, and thanks, Lincoln, for the trails system! Click on the small image to open a special, larger image window. Then click on the forward or back arrows to see other pictures of each bike. Take a look at the ground from high above. A friend of mine once proudly wore a hat that had bird droppings printed on it. This one takes a bit of study-lots of information here. Situated by the Department of Roads. One of my favorites. I'm partial to musical themes. Covered by ceramic roses. This was a victim of vandalism, and had to be re-done. School children helped to re-create the roses. You can just tell, this is a friendly Bike-a-Saurus. I consider the road to the airport somewhat bike-hostile. This is one of only two to which I drove instead of bicycled. Very pretty. The pictures don't do it justice. I once made a chess set using squares of dissimilar metals. This reminds me of it. How cute are these little guys! I had to drive to this one, unfortunately. I think this is the prettiest one. Very Lincoln. His arms sway for balance! Be sure to look at the miniatures. This guy's my buddy. I see him every day. He's friendly, kind of like C-3PO of Star Wars. Sometimes he's riding. Sometimes he's riding backwards. Lance has made a big impact. Someone had chalked, "Lance - GO" on the sidewalk beside him. So many of these have a family theme. Reflects something about Lincoln, I'd say. You can miss the point of this if you don't see it from the right angle. 47. Mountain Bike, by Max D. Reis Jr.
Again, a photo doesn't do justice to the fine metalwork. A lot of school children had a part in this. This makes three that used the mountain bike theme, in very different ways. It took a while to realize that the original bike pattern became the shadow of this tubular bike. This is in the mall. Be sure you look at all seven photos! I've always liked marbles, too. Beautiful woodwork. See the artist's explanation of the title at the ArtScene website. This even had a little wind chime at first. I raked the sand, and one time stopped to fix the chain on my bike at this spot. You know my feelings about the musical bikes. Use the shift levers to make your own designs with chalk. The ultimate in participatory art.